The FAU Career Center is happy to assist you with your job search needs or help you connect with the campus community. Be sure to take advantage of our online resources listed below. Disclaimer: Alumni Career Services are exclusively for FAU graduates. Graduates are defined as those that have completed a minimum of a bachelor’s degree from FAU. While our services are provided to assist alumni in managing his/her job search efforts, they are not to be viewed as placement services. Alumni Career Services is provided by the FAU Career Center and is not included in the FAU Alumni Association fee. This option provides you the opportunity to meet with a career counselor for help in making important career decisions, resume/cover letter critiques, prepare for interviews, develop a job search strategy, or explore a career change. A career assessment inventory is also available for a onetime fee of $50. This includes one individual counseling session for a personal interpretation. The career assessment we offer is the Strong Interest Inventory (SII). Alumni who miss an appointment (aka no-show) or don't cancel their appointment two (2) business days prior to the scheduled appointment will forfeit the $65 (or $50 career assessment) fee for the scheduled session. Weekends and holidays cannot be counted in the two (2) day time period. Job Postings- apply for jobs online via Handshake. Upload your resume for employers to view in the searchable candidate resume database. Submit your resume electronically for employment opportunities posted by employers. Apply for and schedule on-campus interviews with employers who have requested alumni (candidates who are within one year post graduation). Set-up a job agent to notify you each time a new employment opportunity is posted that meets your qualifications. Receive announcements about employer information sessions or special career events. Career Fairs/Expos and Graduate School Fairs. Attend career workshops, etiquette dining events, and employer panels. On-Campus Interviews for entry level positions. Alumni are eligible to participate in the On-Campus Interview (OCI) program with employers who request alumni. Alumni must meet the employer's specifications (i.e. major, degree level, graduation date) and apply through Handshake. Attend Employer Information Sessions - Alumni are invited to attend employer information sessions when the employer is recruiting alumni. Information sessions are found within Handshake. Career Source Florida Our dedicated team of career counselors, business coaches and training providers – and our career centers in West Palm Beach and Belle Glade – help area businesses stay competitive through training grants and talent acquisition, and job seekers find new jobs through career assessments, training and employment assistance. 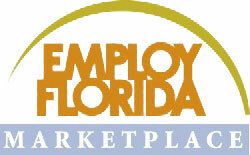 Employ Florida is an online resource that links all of Florida's workforce services—state and local—to each other. The state partners are CareerSource Florida, the state policy and oversight board, and the Department of Economic Opportunity. At the local level there are twenty-four regional workforce boards that administer close to 100 "one-stop centers” in the CareerSource Florida system. Locally, CareerSource Palm Beach County has career centers in West Palm Beach and Belle Glade.